I have read and loved books from many of the author's below. I'm in the midst of reading them all and I can already tell you that this is a box set you don't want to miss!! I love that all the proceeds are going to go to 2 animal shelters (see pic above for the names). In addition there is a giveaway being graciously given by one of the authors for all of you. One winner will receive a $25 Amazon GC or a $25 PayPal. Two additional winners will win a copy of the box set (e-book). A win for the animals and a win for three of you!! Bonus recipes from the authors are included! The winners will be chosen via Rafflecopter. I will email the winners who must respond to that email within 48 hours. I will forward the email to the author who will be responsible for getting your prize to you. I’ve read and enjoyed books written by Amy Vansant, Anna Celeste Burke, Anne R. Tan, Cindy Bell, Colleen Helme, Colleen Mooney, Judith Lucci , and Susan Boles. I think it’s wonderful these authors are donating all profits from this box set to two animal charities. I think that what the authors are doing is wonderful. There are so many animals in shelters that need love and support. A pet gives you unconditional love! As for the authors, I have had the opportunity to read most of their books and love the genre of cozy mysteries. It's easier to list those I haven't rad, lol! New to me are Ava Mallory, Sandi Scott, Susan Boles, and Cindy Bell. Thanks for the chance! It's about 50/50 of those I have read. I support animal shelters & Happy to support this cause. They are all new to me, but I hope to check them out. I'm glad that they work to help animals. I've read all of the authors. And yes I am so glad they are they helping the animals. I've heard of Anna Celeste. They are all new to me! Thanks for the chance to win. Yes, it's great that they are donating to animal charities. I've read books by Cindy Bell (I'm currently reading her latest, Murder at Pooch Park) and Anne R. Tan. I probably own quite a few by the other authors that I've gotten free and haven't read yet. I know I have some by Sandi Scott and Anna Celeste Burke. I've read and follow Anne Celeste Burke and I love that cover!!!!! 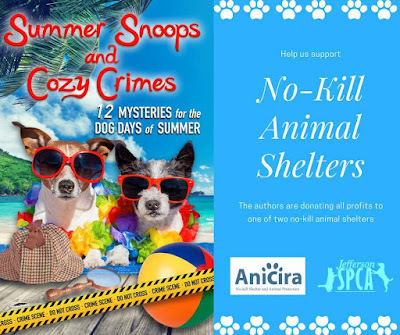 Even if I wasn't a fan of cozy mysteries, I would've bought this book just because the purchase was going to No Kill shelters. As a parent to a rescue fur baby, it is an issue very dear to my heart. There are a few authors that are new to me so I'm looking forward to reading those stories. Thank you for the giveaway and your support to such an incredible cause! I think it is wonderful that money is going to help animals. The authors are new to me. Have to admit - I don't remember reading any of these authors. Which is strange, as I love books with animal characters. Thanks for the chance to get a copy of them. And BIG YES I think it is awesome that proceeds go to support no-kill shelters. I have to admit, I have been out of the loop as far as reading is concerned, but would love to get reading again. All of the authors in this giveaway have fabulous looking reads and I am most definitely going to check a few of them out. I love the cause for this giveaway as all of my pets are rescue pets and they are the most loyal and loving animals ever! I haven't read any of the authors yet. I love the idea of cozy mysteries though. They sound like wonderful reading! I have read Anna Burke and Sam Cheever. I love both of these ladies awesome work. I had pre-ordered this set and started reading as soon as I received it. I absolutely love that the proceeds are benefiting animal shelters. Thank you from the bottom of my heart for that. I am familiar with most of these authors. A.C. Burke is a favorite. I have read and enjoyed Anna Celeste Burke and think it's great they are donating their profits. I have read this book and I loved all of the stories. When I went to follow the authors I have already followed all of them as they are authors I know and read. I've read most of the authors with just a couple of authors being new to me. I love that the book profits are going to help animals. Cozy mysteries are my favorites because they are clean. I had read books by half of these authors already. Colleen Helme is one where I got the first in the series free and went on to buy the rest because I loved the first so much! I already finished the whole set of this box set. It is nice to get a look at how each of the writers' work goes. Animals shelters need all the funds they can get. Good work on this charity! I think all of these authors are new to me! I love that they support animal charities! I think I've read several books from almost all of the authors and I've bought the boxset already! And it's amazing what they are doing to support animals! I am pretty sure Colleen Helme is the only author from whom I do not own a book. Animal charities are a fine choice to donate to.